Originally from Staffordshire, UK, Nigel Hook now resides in Del Mar, California, where he owns DATASKILL, Inc. — an INC-500 Data Analytics and Software Engineering firm. He holds an MBA in Management and a Bachelor’s degree in Computer Science from Staffordshire University in England. His background software engineering and data analytics has been the key in achieving peak performance in the racing world. Nobody today has more experience or wins racing high-speed mono-hulls in the open ocean. Nigel’s attraction to powerboat racing came at an early age, following his mentor and uncle, the late Roger Hook, (British National Champion ’68, ’69) to hundreds of circuit and offshore races, including the legendary Cowes-Torquay-Cowes. In 1974, Nigel seized the opportunity to compete in his first race, the Dawlish 100. Co- driving with his uncle in Arri Clappers, a UIM Class III Offshore mono-hull powered by twin Mercury outboards. After moving to California in 1984, Nigel set about building a new V-hull to race in the Pacific Offshore Powerboat Racing Association (POPBRA) series. He throttled the boat to the 1989 POPBRA High Points Championship and also set the Powerboat Magazine World Speed Trials record for Class VII. For the inaugural 1990 season of the Offshore Professional Tour (OPT), founded by the actor and World Champion Don Johnson, Nigel teamed up with Rick Bowling to race Gone Again, a Conquest cat powered by triple Mercury 300hp outboards. In Pro I Class they finished fourth overall for the season and took a third in the final OPT World Championship race in Key West. During the same year in California, he also retained his POPBRA championship in Class VII. In 1991, with substantial support from Warlock powerboats in providing a 25′ Warlock cat and racing with Craig Archer in S11- Archer Marine, they captured first place, APBA National Stock Class, in the first “East vs. West Shootout” in Texas. Competing nationally again in the Offshore Professional Tour Nigel raced with Scott Duvall, in Manta Racing, a twin engined monohull powered by NASCAR-style small blocks. With Nigel as the Driver, Manta Racing garnered the OPT National Championship. Nigel finished the season racing with another of the sports greats, Art Lily, in the 33′ Fountain Heartbeat in the combined OPT and SBR World Championships in Key West, Florida. In 1992, Nigel took S11-Archer Marine to win the APBA Stock Class Championship, Western Division, and also set the Powerboat Magazine Speed Trials record in Class III at 96.5 mph. In the same year, Nigel raced with Scott Duvall in Manta Racing to win the OPT National Championship-Pro II. The season was capped bringing CysticFibrosis Express, a 33′ Fountain, to a third place finish in the combined SBR and U.S. Offshore World Championships in Key West. In 1993, today long-time relationship with Wellcraft Scarab was founded and Nigel built a 26′ Wellcraft Scarab, Archer Marine Scarab, equipped with the first pre-production MerCruiser Blackhawk surface drive. This very light weight hull, designed by Larry Smith and constructed by RD Boatworks, builder of Dennis Conners’s America’s Cup winning Sailboat, set new standards in APBA’s largest and most competitive class. With Nigel throttling, she won the APBA “A” Class Championship, Western Division. And, at Sarasota in July, Nigel set the APBA/UIM World Kilo Record at 93.17 mph, blasting the existing 8-year-old record by almost 10 mph. This garnered the team the highly prestigious Mike Poppa Award. In 1994 APBA National Championship was won and the Archer Marine Scarab garnished a record of 19 first-place wins (4 DFNs) out of 26 combined national and divisional APBA races. The 1995 season continued with more National and Divisional wins and was capped off with winning the International Offshore Cup in Puerto Rico. In 1996, Nigel, moved to the twin engine class and created the most advanced Wellcraft Scarab of the century – the new Wellcraft Scarab 37H. This design introduced European – style vented steps with a very narrow beam – almost two foot narrower than the existing 38′ Scarab. With Westerly Marine and Baltek, Nigel engineered a nomex-cored pre-preg carbon fibre composite, pushing the lamination schedule even further beyond his 26′ Scarab, and ending up with an extremely strong and safe, yet very light race boat. With Nigel on the Throttles the new team went on to finish the 1996 racing season with third place in C class in the APBA World Championships in Key West, Florida. For the 1997 season Wellcraft brought the team into an agreement with NASCAR sponsor, CITGO Petroleum Corporation. CITGO was keen to sponsor the new Scarab 37H and the team raced the boat as the CITGO SUPERGARD Scarab. CITGO’s involvement helped the team win the 1997 Western Divisional Championship, High Points Overall, and the APBA National Championship in B Class to earn the designation US1. 1998 set an unprecedented season with a WORLD CHAMPIONSHIP and back-to-back National Titles. In addition, the team accrued more points nationally than any other race boat across all classes in APBA Offshore. In the process, winning the Western Division Championship in Class B and the S.E. Divisional Championship, which elevated the team to the highest honor in American Power Boat Racing — Nigel was inducted into the APBA Hall of Champions. The 1999 season was invested in elevating the power of the 37H Scarab from 1500hp to 2200hp in order to compete in the top level Super Vee class and further the development of the new 43 foot Scarab incorporating the latest in racing technology. The new 43 foot CITGO SUPERGARD Scarab made its entry in the 2000 season opener in San Diego, leading the fleet by a huge margin prior to crashing. The season finished out with three first place victories including a first place in the final round of the 2000 World Championships in St. Petersburg. Setting an APBA/UIM World Speed record in the Armada CITGO Special added to the season’s success. This was his first action in the Reindl One Design Series, then called the APBA V-Class where he teamed up with Steve David. In 2001 he earned the APBA 3rd place National Championship and was the APBA Western Divisional Champion for the new title sponsor, CONSECO with Wellcraft and the associated sponsor, Lucas Oil Products. The 2002 season garnered the Grand Bahamian Champion, APBA Western Division Champion, and the APBA N.E. Division Champion. Then in 2003, again the APBA Western Division Champion as well as APBA 3rd place World Championships. Also in 2003, Hook was honored to be invited to join a USO Tour to Afghanistan and the Middle-East with NASCAR drivers, including Daytona 500 winner Geoffrey Bodine, Jerry Nadeau, and Army Top Fuel seven time World Champion Tony Schumaker. The Tour was hosted by General John Keane, Vice-Chief of Staff US Army, and introduced the race drivers to the brave American and NATO troops in a live war zone. 2004 extended the reach of his success by adding an APBA Central Division Championship and a 2nd place in the APBA National Championships. Hook drove the 37’ Scarab to many wins in the APBA National series. The Scarab had been converted top-side with a Cougar deck and single F-16 cockpit and fitted with Weismann drives and an opposing engine configuration, where the engines faced each other bell-housing to bell-housing, giving the boat an entirely torque-neutral balance and extremely low center of gravity. This boat is now hung in the main entrance of the Indianapolis Colts Lucas Oil Stadium. Also In 2004, Hook starred in the 1200 mile endurance ESPN covered event “Nuestros Rios Son Navigables” and won 1st in class in the speed category. This South American race, bolstered by a 31 year legacy, endures 1,200 miles through the Amazon rain forest and plains — the ultimate trial of man, machine and the water. Sponsored by CITGO (PDVSA), Ilmor (with V10 engines), and Eliminator, Nigel took the team’s Daytona 32 tunnel boat through to the Amazon plains, into Colombia, and across Venezuela to be the first inboard boat in the final spint. This was the first unveiling of Ilmor’s V10 Viper based engines in a race format. The ESPN show featured Hook pitted against fellow American and Harmsworth Trophy winner Mike Seebold, son of tunnel boat racing legend Billy Seebold. In 2005, Hook leased a Skater V399, formerly Spiderman I, and set a speed record at the Chattanooga Mile, and first in Super Vee class racing with former Top Gun Instructor, US Navy F-16 fighter pilot, Dave Maquera. In the Worlds at Key West, Hook brought on driver James Sheppard to take 4th place in Super Vee class as 7 Lucas Oil / King of Shaves. In 2006, building a new Skater V399 with self-designed hull modifications, Hook and Sheppard in the #7 Lucas Oil / King of Shaves, running under British flag, seized the World Championship, with French taking second and an American team, also in a Skater, third place on the podium. The National season also gained first places in Marathon, Florida, Washington North Carolina, and Sarasota, Florida. In 2007, Nigel Hook Racing went global promoting Lucas Oil World Wide by joining the relatively new Powerboat P1 series. Teaming with the Outerlimits Factory in SV-40, Hook and Joe Sgro in the #77 Lucas Oil won the British Grand Prix in historical Cowes and proudly accepted the trophy presented by Lord Maxwell Beaverbrook. The team took podium finishes in Travemunde, Germany, Naples, Italy, and Zeebrugge, Belgium. In 2008, Hook promoted Shelly Jory from the Honda class racing to be the first female driver in the top International Evolution class in Powerboat P1. With races across Europe in Spain, Portugal, Malta, and in Africa, the #77 Lucas Oil clinched a fourth place overall in World standings. The 2008 campaign has been captured in a Children’s book and is part of a six book series also featuring Jenson Button from Formula One. Hook finished the season for the #77 Lucas Oil reuniting with former team-mate Joe Sgro in a brand new design Outerlimits 43 to win the APBA/UIM/Superboat Super Vee Unlimited World Championship in Key West. In 2010, Nigel Hook Racing formed a partnership with a new team called Scandinavian Offshore Challenge owned by Michael Silfverberg. Hook engaged renowned Naval Swedish Architect Ocke Mannerfelt to design a totally new race boat. Hook had become fiends with Mannerfelt since 1994, when the Mannerfelt-designed Bat Boat made its debut in the USA. After reigning in the A Class, Hook became fascinated with the brilliant design that proved so competitive against his Scarab. Bat Boat had wings, which stabilized the boat with aerodynamics rather than relying on hydrodynamics. The design was so competitive that the APBA banned it, and from then onward, it ran in its own one design class. The new race boat for the UIM Powerboat Grand Prix of the Sea, co-designed by Ted Mannerfelt (Ocke Mannerfelt’s son and former Jaguar automotive designer), was built in Canada by Vector Powerboats. The #77 Lucas Oil Scandinavian Offshore Challenge was powered by Ilmor V-10 engines, using the Ilmor INDY drive system for the first time in racing. In 2011, Nigel and his partner Michael Silfverberg leveraged their experience with the Vector V40 to design a 100% race boat, re-engaging Mannerfelt Design Team and Mystic Powerboats. The new SilverHook weighs in around 9,000 pounds with a carbon fiber, BPM surface drives, a Latham Marine rudder/steering system, and a pair of Class 1 racing engines from Sterling Performance. Nigel competed in the SilverHook in the 2011 Ocean Grand Prix (OGP) Powerboat World Championship with outstanding results, securing 2nd place in the Maltese Grand Prix and 1st place in the Siracusa Grand Prix. After shipping the boat back to the USA to compete in the SBI Key West World Championships, Nigel took 1st place during Sunday’s race in the Super V Extreme class. In 2012, Nigel and his partner Michael Silfverberg continued to campaign 77 Lucas Oil SilverHook 48GP racing exclusively in the Extreme class of the Superboat International series. With a come-from-behind win during the 28th annual Sarasota, Nigel and his team were awarded the Kevin Brown Sportsmanship Award and finished the season as the National Champions in Extreme class and 2nd place in Extreme Class for the World Championships. In 2013, Nigel and his long time partner, Michael Silfverberg rerigged SilverHook with Mercury 1075 racing engines and once again launched an assault on the Extreme class in Superboat International, finishing in 1st place Biloxi, Cocoa Beach, Orange Beach, and Michigan City to once again secure the Extreme class National Championships and repeating 2nd place in the World Championships. 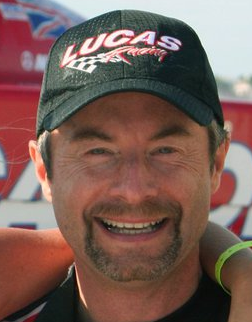 In 2014, stepping up to the Unlimited class of Superboat International, Nigel was joined by several drivers including Miles Jennings (Cocoa Beach and Clearwater), Shelley Jory (Sarasota) and long-time friend and previous World Champion driver Jay Johnson (Michigan City, Orange Beach and Pensacola) as well as Michael Silfverberg (Charlotte Harbor and Key West). Taking 1st place in Michigan City and Orange Beach with solid podium finishes in the other national races resulted in National Championship title and 2nd place in the Fl Championships. In 2015, Nigel joined forces with long time friend and previous driver, Jay Johnson to race Superboat International. 2003 World Record, San Francisco to L.A.